In just a few months, customers of the complex being developed next to the Młociny underground station will be able to shop in a store belonging to a Polish network KONSIMO. The storewill occupy an area of 630 sqm and it will be the brand's debut on the market in the capital city. The opening of Galeria Młociny, which is already nearly 90% leased, is planned for the spring of next year. KONSIMO is a unique furniture discount that offers a wide range of products for home, starting from cabinet and upholstered furniture, through textiles and carpets to ceramics, kitchen utensils and decorative elements. The recipe for brand success - which already owns stores in Poznań and Leszno, but prepares new openings in the largest Polish cities - are products that have a unique relationship of quality, price and design. A unique, especially in this industry, advantage is availability of all offered products which are delivered within the extremely short time, in just a few days. The author of the KONSIMO brand is an experienced team of designers, stylists, designers, constructors and technologists, creating products based on the latest global and Polish trends. "It is difficult to make a better debut in Warsaw than entering one of the largest and most modern shopping, service and entertainment complexes. I am convinced that the opening of the KONSIMO store in Galeria Młociny will allow us to successfully compete for attention of customers interested in exceptional design in an excellent price-to-quality relationship" emphasizes Dawid Jaschok, President of the Management Board of KONSIMO. All products available in KONSIMO are grouped into seven collections, according to styles in which they were designed. Not only accessories, but also original furniture collections inspired by Scandinavian minimalism, modernistic design, Italian styles, elegant or classic are waiting for customers. The brand also has taken care of two collections dedicated to slightly younger customers - children and young people. The creators of KONSIMO stress that the arrangement of stores based on internally coherent zones with individual styles on the one hand significantly improves the comfort of shopping, and on the other hand - it is an inspiration to decorate the space in harmony with your favourite style. KONSIMO also has a very dynamic online store that allows you to purchase all online products with free collection at a stationary store. "The end of the year at Galeria Młociny is very intense. The completion of construction works is accompanied by launcing new lease agreements. We are pleased that the complex we are building will be enriched by a young and interesting brand that is undoubtedly KONSIMO. Thanks to its opening, the offer of stores with interior decoration available in our complex will be even more interesting and more diversified" says Marcin Kopczyk - Senior Leasing Manager at Echo Investment's Shopping Centers Department. KONSIMO will be the eighth brand representing the furnishing and interior design segment, which decided to open its store in Galeria Młociny. Earlier, Zara Home, Homla, Komfort, JYSK, Mensa Home, Flying Tiger Copenhagen and DUKA decided to be present in the facility located in northern Warsaw. Marcin Kopczyk emphasizes that the new agreements have brought Galeria Młociny to the forefront of commercial complexes, where home furnishings stores are so strongly represented. The nearly 90% leased building is at the last stage of the construction - finishing works. The first premises are handed over by the largest tenants who will soon end finishing and arranging their stores. 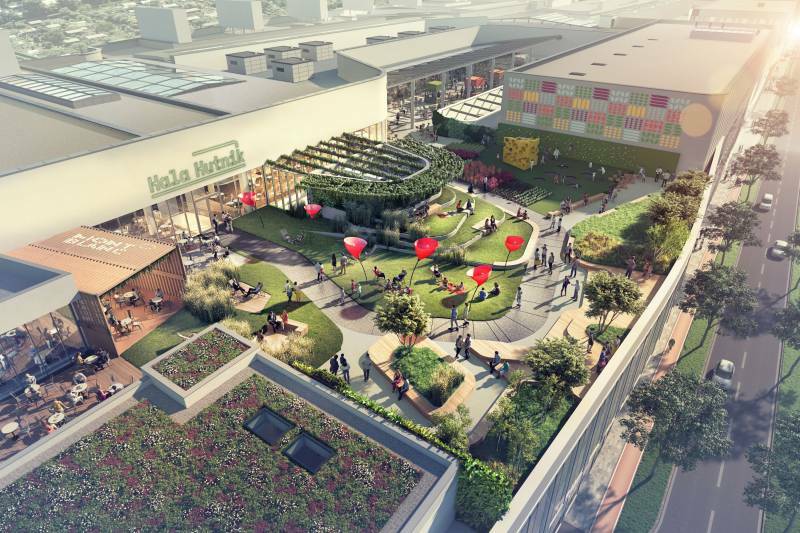 Galeria Młociny is being developed right next to Młociny hub – one of the places with the best transport links in Warsaw, with direct access to the underground, numerous tram lines and bus routes, suburban and national buses, a bicycle station and a P&R car park. It is the most important transfer location for the northern part of the city and satellite towns and it is used by over 24 mln passengers every year. Investors of Galeria Młociny are: EPP (70 pct shares) and Echo Investment (30 pct shares). The former company will manage the newly-opened complex. The latter one is fully responsible for the development and lease process.